Uruguay's president, Jose “Pepe” Mujica, a former guerrilla who lives on a farm and gives most of his salary to charity, is stepping down after five years in office, ending his term as one of the world's most popular leaders ever. "I became president filled with idealism, but then reality hit,"Mujica said in an interview with a local newspaper earlier this week, according to AFP. Some call him “the world’s poorest president.” Others the "president every other country would like to have." But Mujica says "there's still so much to do" and hopes that the next government, led by Tabare Vazquez (who was elected president for a second time last November) will be “better than mine and will have greater success." Uruguay's $55 billion economy has grown an average 5.7 percent annually since 2005, according to the World Bank. Uruguay has maintained its decreasing trend in public debt-to-GDP ratio – from 100 percent in 2003 to 60 percent by 2014. It has also managed to decrease the cost of its debt, and reduce dollarization - from 80 percent in 2002 to 50 percent in 2014. “We’ve had positive years for equality. Ten years ago, about 39 percent of Uruguayans lived below the poverty line; we’ve brought that down to under 11 percent and we’ve reduced extreme poverty from 5 percent to only 0.5 percent,”Mujica told the Guardian in November. 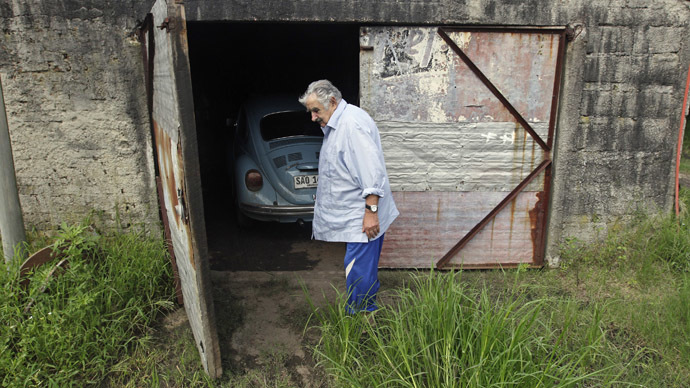 Mujica, a former leftist Tupamaro guerrilla leader, spent 13 years in jail during the years of Uruguay's military dictatorship. He survived torture and endless months of solitary confinement. Majica said he never regretted his time in jail, which he believes helped shape his character. Mujica's kindness speaks volumes: He refused to move to Uruguay’s luxurious presidential mansion to live in a farm outside Montevideo with his wife and a three-legged dog named Manuela. Pepe gives away about 90 percent of his salary to charity, saying he simply doesn't need it. He drives an 1987 Volkswagen Beetle.